I'm a big fan of Sherlock Holmes. I've loved the stories by Conan Doyle since I first read them, I avidly watched the Jeremy Brett TV series in the 1980s and I can't miss an episode of Benedict Cumberbatch's Sherlock. However, when I saw there was now a tarot deck based on the the consulting detective, I was a little unsure about how well the theme would translate into a divination tool. Conan Doyle might have been into things mystical, but his fictional sleuth was very much a man of science and rational deduction. Nevertheless I was eager to try out the new boxed set Sherlock Holmes Tarot Book and Cards. Its creators, John Matthews and Wil Kinghan are renowned tarot set designers. Their previous decks include The Steampunk Tarot: Gods of the Machine. The new Sherlock Holmes deck is unlike any I have used before. As the book that comes with the set says: "...the imagery, while echoing that of a standard tarot deck, to a degree, also offers different images and interpretations." Very different, I would say. The suits, for example, are observation, evidence, analysis and deduction rather than swords, wands, cups and coins. 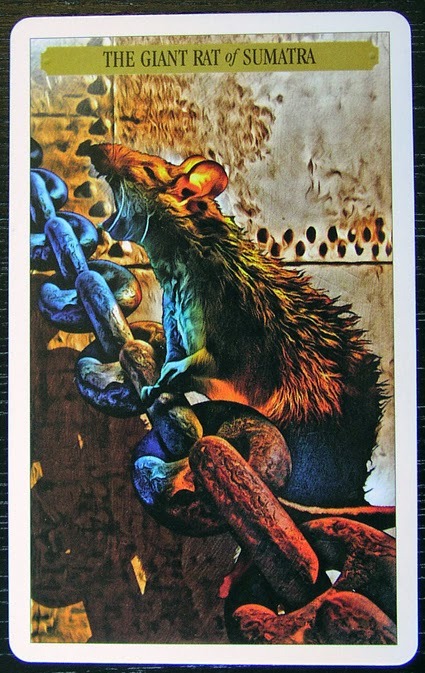 You only have to look at the photos of cards on this post to see that they offer some very non-standard depictions and names and there is even a new wild card - the Giant Rat of Sumatra. Even if you are an experienced tarot reader, you will have to read the book before using the set, and then familiarise yourself quite well with the individual cards before doing a reading. 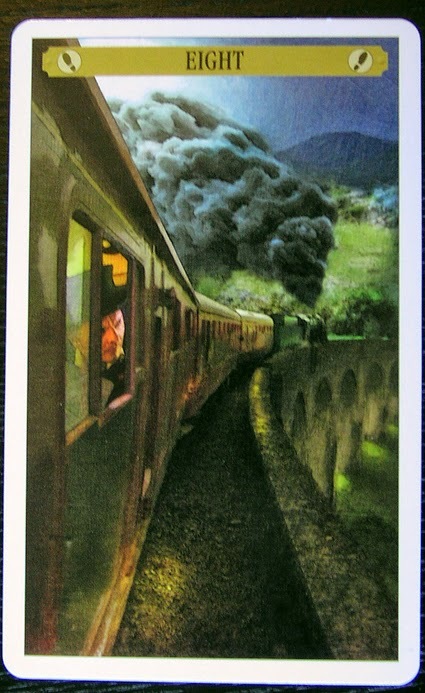 Even if you don't want to use this set for the purposes of divination, Holmes' fans will love the artwork showing Holmes, Watson and other characters, scenes and locations from the stories, as well as commentary on them that is offered alongside suggested interpretations of the cards. As publisher Connections says on its website: "Original characters make up the Major Arcana, and Arthur Conan Doyle’s stories are featured throughout. Victorian London, with its shadowy buildings and fog-bound streets, forms the perfect setting for the card imagery." The boxed set can be bought at Atlantis Books in London, which held the launch party for the deck, or ordered via Amazon. Love the artwork on these. But to me, all these alternative oracles and card decks, however fun they are, don't ring true. If the tarot is simply the user projecting their own thoughts and meanings onto the cards then I suppose one deck is no different to any other. However, if there is any true arcane power in the original symbols then it is lost here. Many of these alternate decks also come over as being merely a moneymaking exercise. If you don't like it, don't buy it I guess. Kevin, I'm probably playing Devil's advocate here, but I'd question whether the original symbols are really any more arcane than some other more modern decks. The Crowley / Thoth deck is chock full of arcane symbolism, but is rather different to the Visconti-Sforza tarot deck, which is I think the oldest known deck. There are, of course, some rubbish modern decks, and decks that look pretty and are sold to card collectors more than serious readers I suspect, but I wouldn't write off all modern decks with new symbolism just because they are modern. And of course the Greenwood Tarot is one of the best there is, with images that are truly original yet seem to tap into something truly magical. No, I wouldn't write off all modern decks just because they differ from the oldest tarot known. Fair comment Badwitch, I know it's an age-old debate as to whether there are certain ways of doing things versus an all-inclusive "anything goes" approach to magic/magick (people can't even agree on a spelling)! My personal belief is that there are certain symbols and rituals which do inherently carry power and that the "anything goes" approach leads to placebo effects, self-delusions and ultimately disappointment with the practices when no results are achieved. I think my view is that tarot decks work best if they tap into archetypal symbols. The pictures themselves may differ from ones painted hundreds of years ago, but if they tap into an archetype then they carry the power of that archetype. So, the Chariot could be represented as a Roman chariot, a Victorian Hansom cab or even a modern motor car. Before chariots were invented, or before wheels were invented even, maybe the archetype would have been a sled drawn by dogs. The archetype still works though. A good work, with gorgeous and elegant pictures, but « the first complete tarot deck based on the famous sleuth » was edited in Spain in June, 2009. This deck of 78 cards too, inspired by the celebrated Tarot of Marseilles, was created by José Luis Errazquin as a complement to the book « El Caso de la Baraja Perversa » (The Case of the Wicked Pack of Cards) by Juan Requena, who search (and find), with great erudition and ingenuity, the 22 Maior Arcana in the Holmesian Canon. A study unique in his genre, but well-know by all the holmesian societies, that does not appear, however, in the bibliography mentioned by the authors of this new version. Thanks for giving the details of the earlier deck - looks interesting. BTW, comments are on moderation at the moment, so they do not appear instantly - no need to post the same thing twice. The Sherlock Holmes deck is delightfully fun. It's a good one for study and novelty, kind of off the wall for actual use in my opinion. I kind of agree with you Melissa.